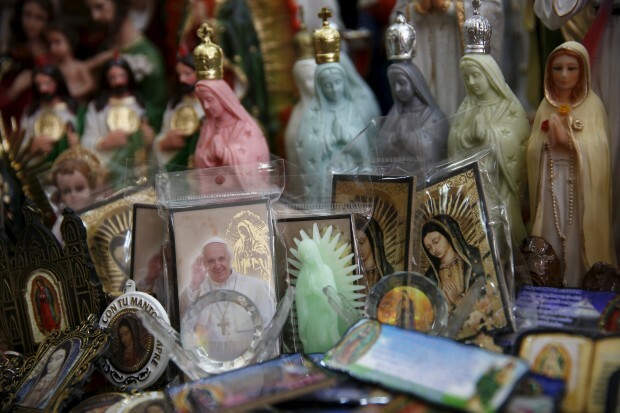 MEXICO CITY (CNS) — With anticipation growing in the streets of Mexico City for Pope Francis’ visit, a group of local pilgrims found time to thank their “mother” and prayed that it would give their country a spiritual awakening. Final preparations were underway at the Basilica of Our Lady of Guadalupe Feb. 11 as workers installed scaffolding and chairs for the thousands of people expected to attend the papal Mass Feb. 13. Although countless security measures have made traveling to the basilica difficult, before the pope’s arrival, pilgrims from across the country continued to come to try to catch a glimpse and pray in front of the mantle bearing the miraculous image of Mary. A group of local farmers from the village of Nuestro Senor de las Maravillas were one of the countless groups waiting to enter the basilica’s Holy Door. Jose Gomez, one of the pilgrims in the group, explained that the pilgrimage was a tradition carried out by the farmers of his village for more than half a century. “We make this pilgrimage to give thanks to the Virgin Mary for everything that has gone well and to pray that it continues to go well,” Gomez told Catholic News Service. Devotion to Our Lady of Guadalupe, who appeared to St. Juan Diego in 1531, is a cornerstone of Mexican faith. Often referring to Mary as “madre” (mother), the pilgrims noted that the pope shares their filial devotion. For Gomez, the pope’s visit to the basilica is a touching honor. “It means a lot for us that he’s coming because he doesn’t go to just any country he wants. We’re really happy he’s coming,” he said. Carrying a banner embroidered with the image of Our Lady of Guadalupe, Maria Concepcion said she was grateful to God for the pope’s visit. She also hoped that it would provoke a change for the better in her country, which has suffered greatly due to violence, drug trafficking and political corruption. “We hope that he’ll reflect on what is wrong in our country and we’re also hoping for, at least, a spiritual change here,” she said.